South Africa’s Gary Player won the first of three Green Jackets in 1961 and on Monday, he told me that his pick of bunch this week was none other than Northern Ireland’s Rory McIlroy. The Black Knight admitted to me that he had a “feeling” that Rory would win this week. “He is one of the most talented young men I’ve ever seen. You have a thing called the ingredients. It’s not how far you hit the ball. The public see players who hit long drives and are very impressed but it’s the ingredients inside a human being that make the difference and gives us champions," said the golf legend. The 21-year-old from Holywood, County Down in Northern Ireland is also attempting to become the second youngest winner of the Masters after Tiger Woods, and crucially holds a four-stroke lead heading into the final round. Chasing hard behind are players from all four corners of the globe. Leading the group on eight under is the 2009 champion Angel Cabrera and also on that number are a South African (Charl Schwartzel), a South Korean (KJ Choi) and an Australian (Jason Day). Australia has never produced a Masters winner in its 75-year history, but Adam Scott produced one of the low rounds of the day with a 67 to lie five off the lead and join compatriot Day in the mix going into the final round. England’s Luke Donald is also seven under par after a 69 and despite winning the Par 3 tournament on Wednesday (no winner of the traditional curtain-raiser has ever gone on to win that year’s tournament); he is trying to become the first British winner since Nick Faldo in 1996. Of the American challengers, Tiger Woods charge of round two was not capitalized upon, despite a good day with the long game. His putter was cold and he disappointed with a two-over return of 74. The best of the home players is Bo Van Pelt, playing in only his second Masters and who returned a fine 68 to get to six under par. 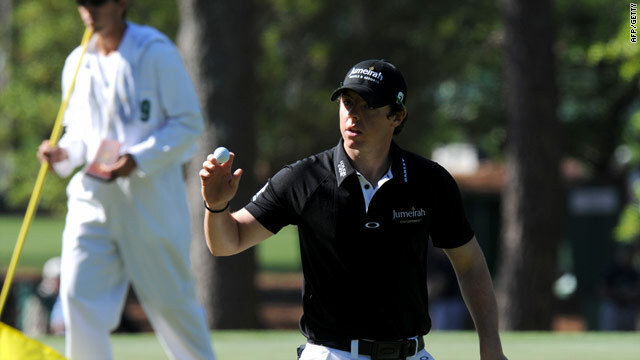 The leader is McIlroy however and his round was underlined by his repeated mantra “patience, patience, patience”. A steady level par opening nine looked to have come unstuck with a dropped shot on the downhill tenth hole, but as he has shown all week, composure reaped dividends as he carded three birdies on the way home, including a scintillating birdie three on the 17th. It was the first sight of a demonstrative McIlroy all week and it gave him that crucial four shot cushion, which he copper-fastened with a par on the final hole. Asked what advice, as a Masters Champion that he would give to young McIlroy, Gary Player was very forthright, “you can’t advise somebody (like McIlroy) in my opinion. You can’t advise Usain Bolt how to run fast, he’s got it! You either have it or you don’t have it. "If you have it you become a champion. There are different categories: good, very good, star and superstar. Rory has a chance to become the best player in the world, in time. That’s up to him and how hungry he is, his desire, what his passion is and what sacrifices he is prepared to make. It is very difficult to say." The tournament looked as open as it has been for years with defending champion Phil Mickelson the favourite and with four-time champion Woods looking to record his first tournament win in almost 18 months.